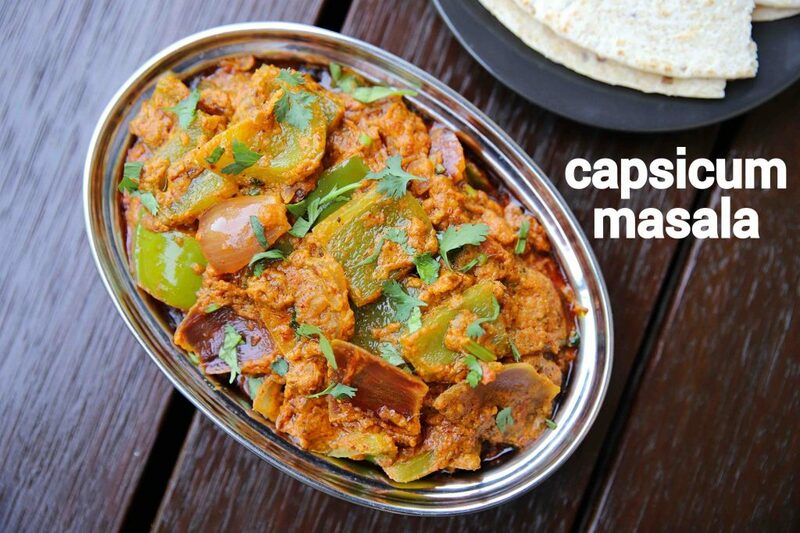 capsicum masala recipe | shimla mirch ki sabji | capsicum curry recipe with detailed photo and video recipe. 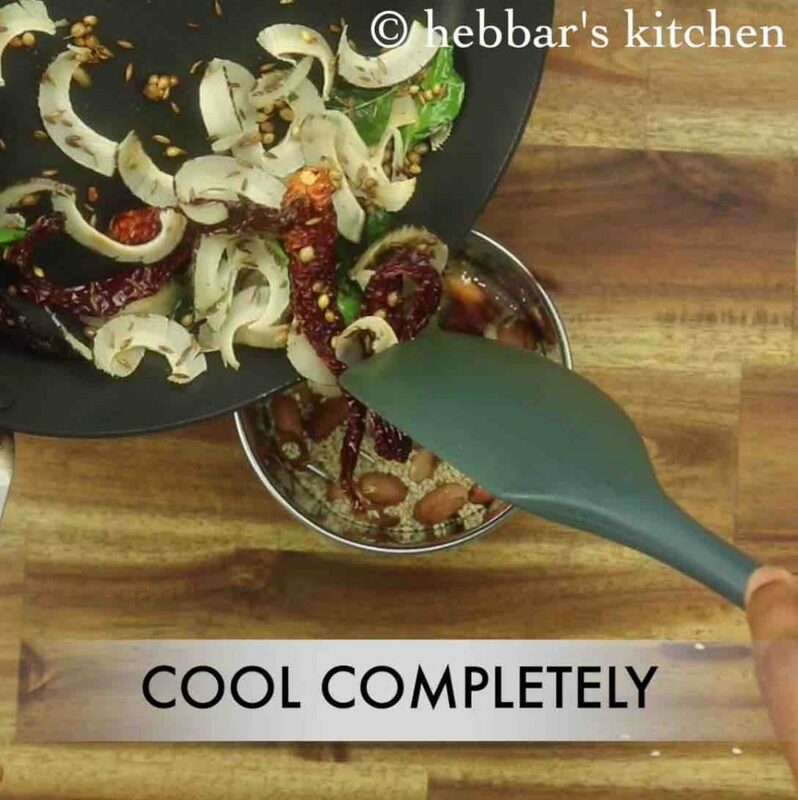 a simple, easy and rich gravy based curry made with peanuts, dry coconut and capsicum. unlike other traditional punjabi curries, the recipe has a unique combination of spices with nuts making it unique curry. 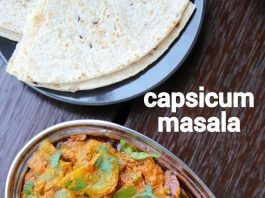 the capsicum curry can be ideally served with different types of indian flat bread or with choice of rice recipe. 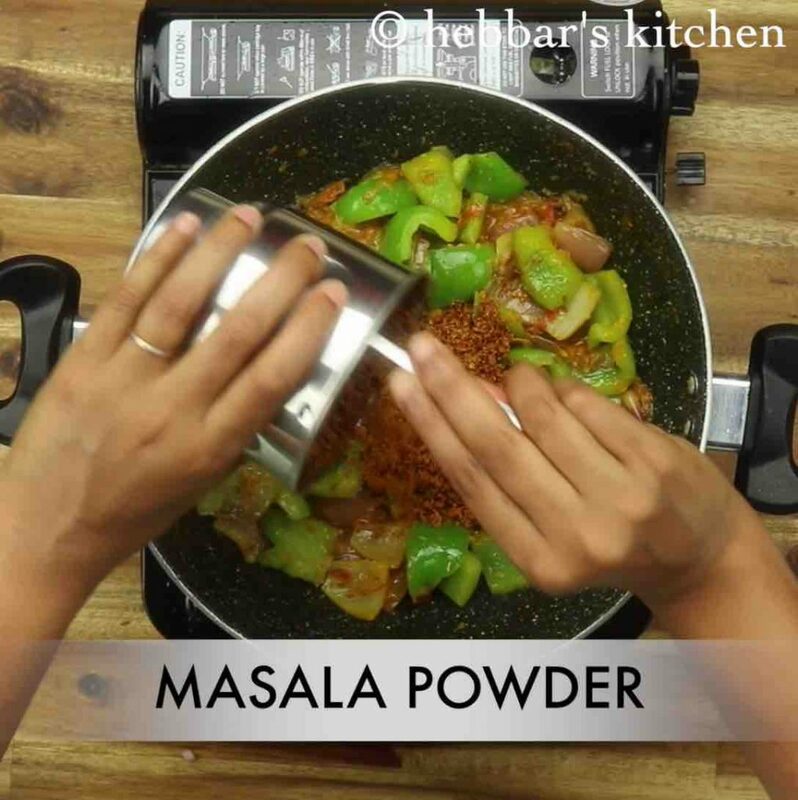 capsicum masala recipe | shimla mirch ki sabji | capsicum curry recipe with step by step photo and video recipe. quick and simple curry or gravy based recipes are always on heavy demand in indian households. the recipe has to be tasty and more importantly without any fancy ingredients and only with in house ingredients. one such rich and creamy gravy based curry recipe is capsicum masala recipe with onion & tomato base. 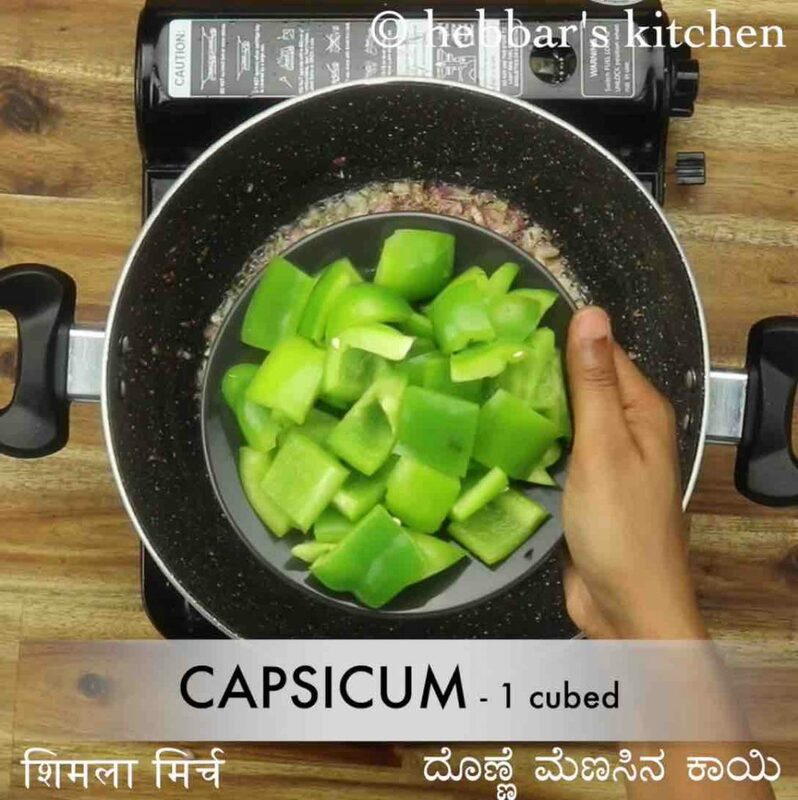 the recipe for capsicum masala or shimla mirch ki sabji is unique compared to other north indian or punjabi curries. typically the punjabi gravies are made from onion and tomato with cashew paste and cream. but in this recipe, i have used a slightly different base. 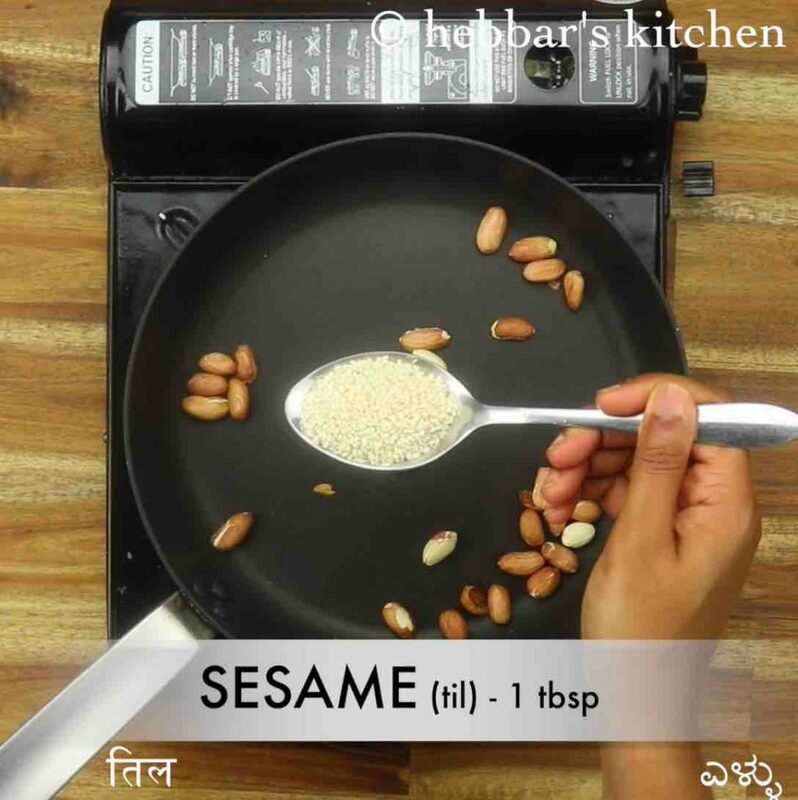 basically, i have used the combination of peanuts, sesame, dry coconut and red chillies with onion and tomato paste. the addition of peanuts and coconut makes it thick and flavorful but with red chillies makes it spicy and flavoured. moreover, the diced capsicum and onions add a hint of sweetness to the gravy. thus making it a complete package by itself for lunch or dinner. 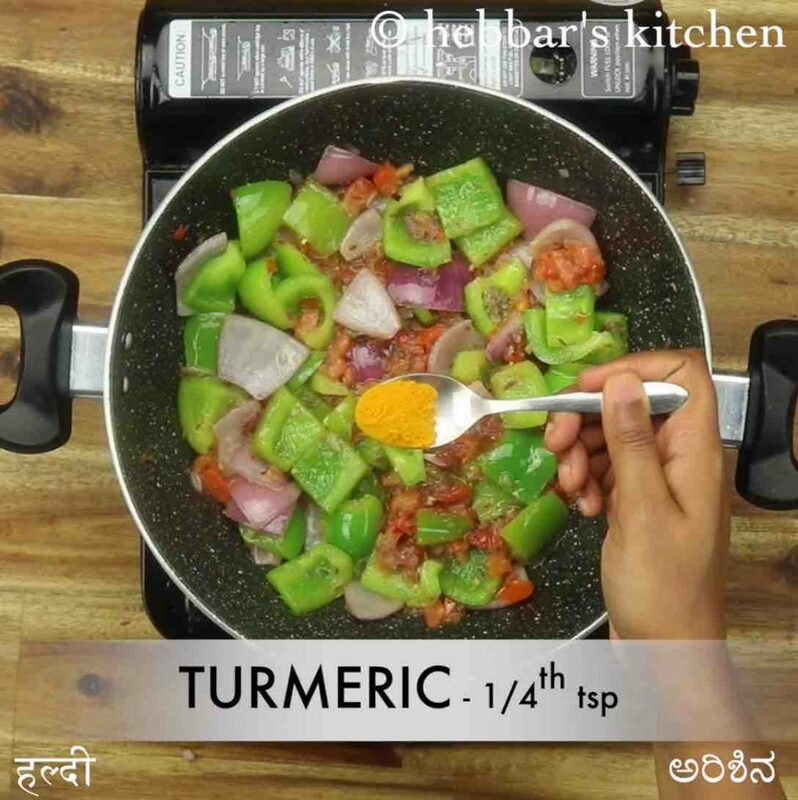 furthermore, some easy tips, suggestions and variations for this creamy capsicum masala recipe or shimla mirch ki sabji. firstly, do not compromise on the quality of capsicum and use fresh and tender capsicum for this recipe. in addition, i have dice it medium sized cubes, you can finely chop it and mix it to the curry. secondly, you can experiment with the recipe and add other supporting vegetables to make it more flavoured. you can add corn, potatoes and even finely chopped spinach as a variation. 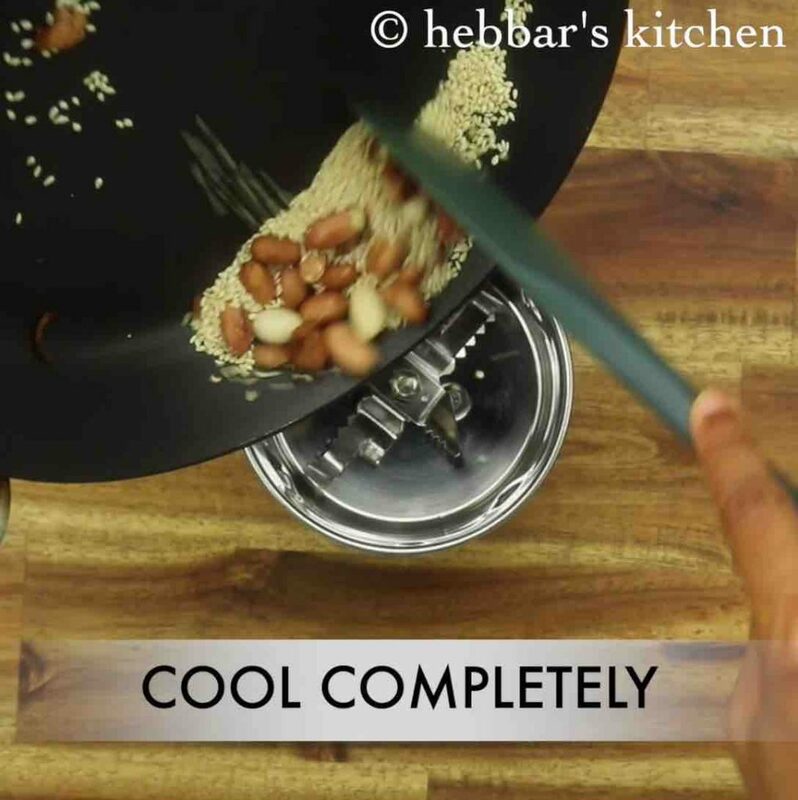 lastly, if you are allergic to nuts then you can ignore it while making the masala. 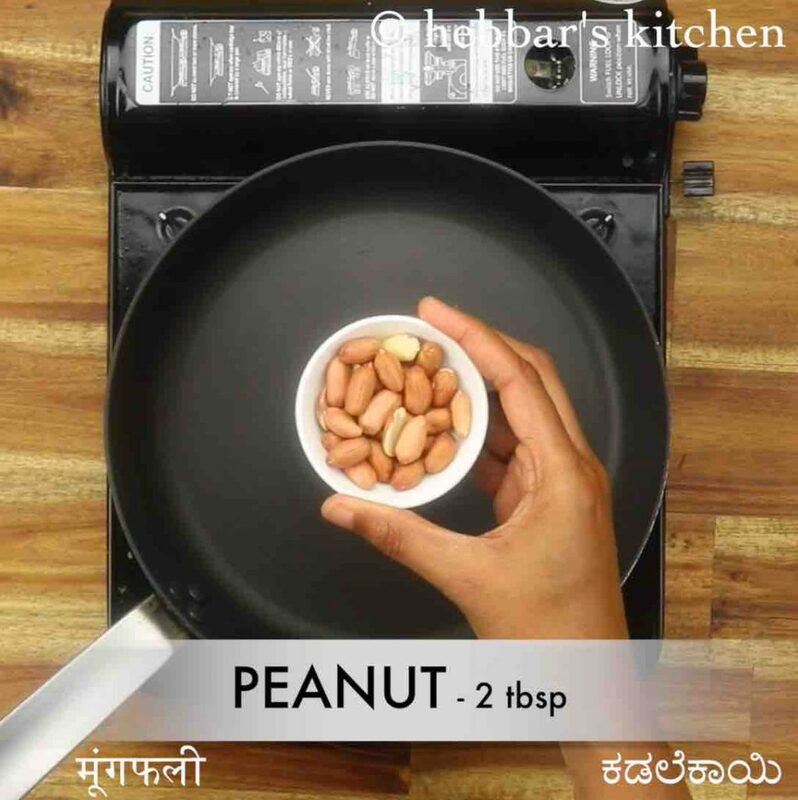 firstly, in a pan dry roast 2 tbsp peanuts until they turn crunchy and skin separates. add in 1 tbsp sesame and roast until they turn aromatic. transfer to the small mixer and allow to cool completely. 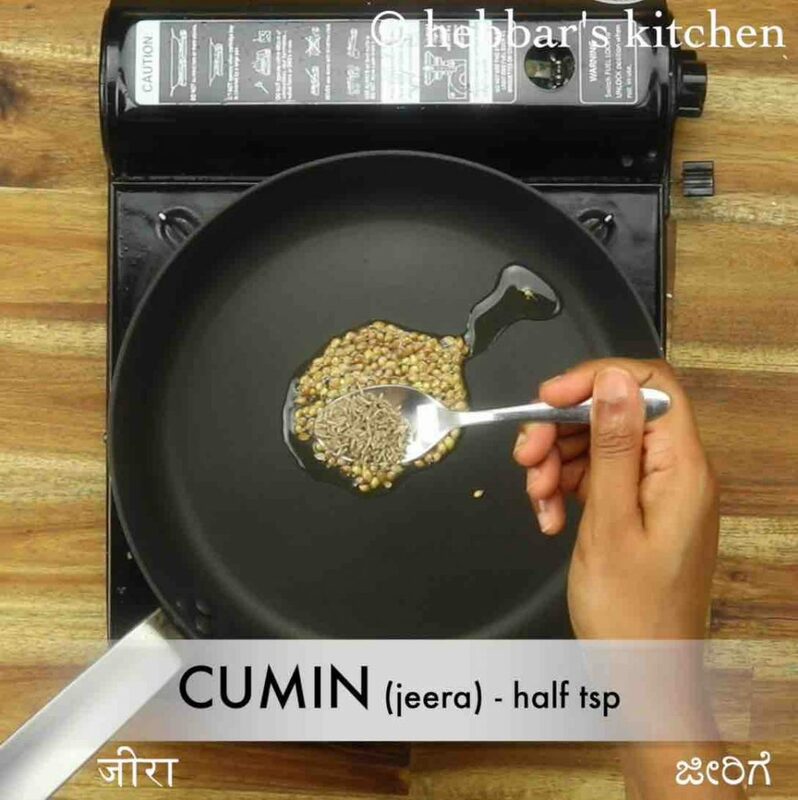 now in the same pan add 1 tsp coriander seeds, ½ tsp cumin, ¼ tsp methi. 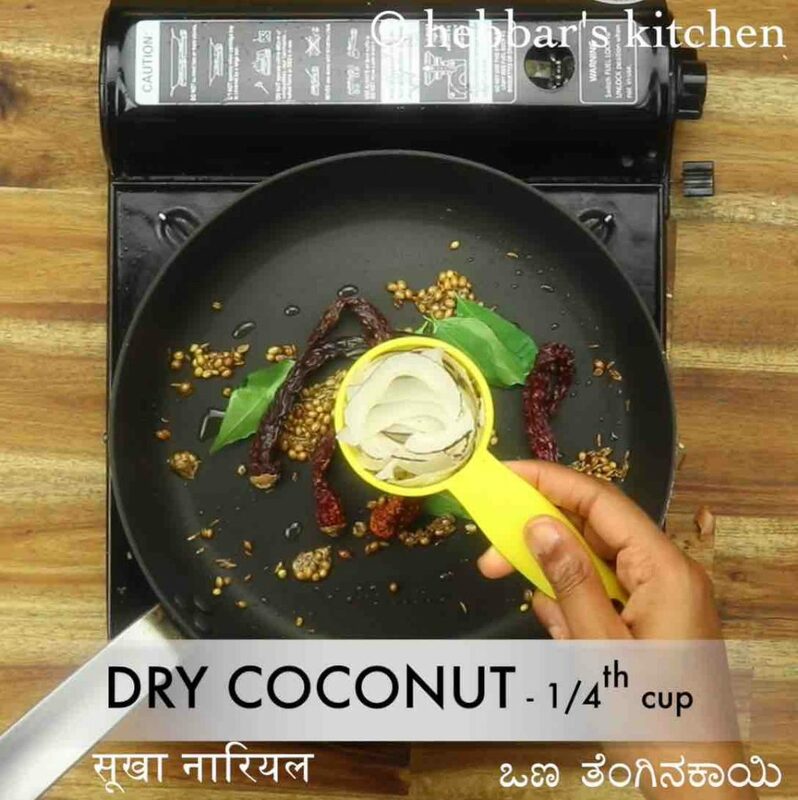 further add few curry leaves, 6 dried red chilli and ¼ cup dry coconut. roast until the coconut turns golden brown. allow them to cool completely, and transfer to the same mixi. 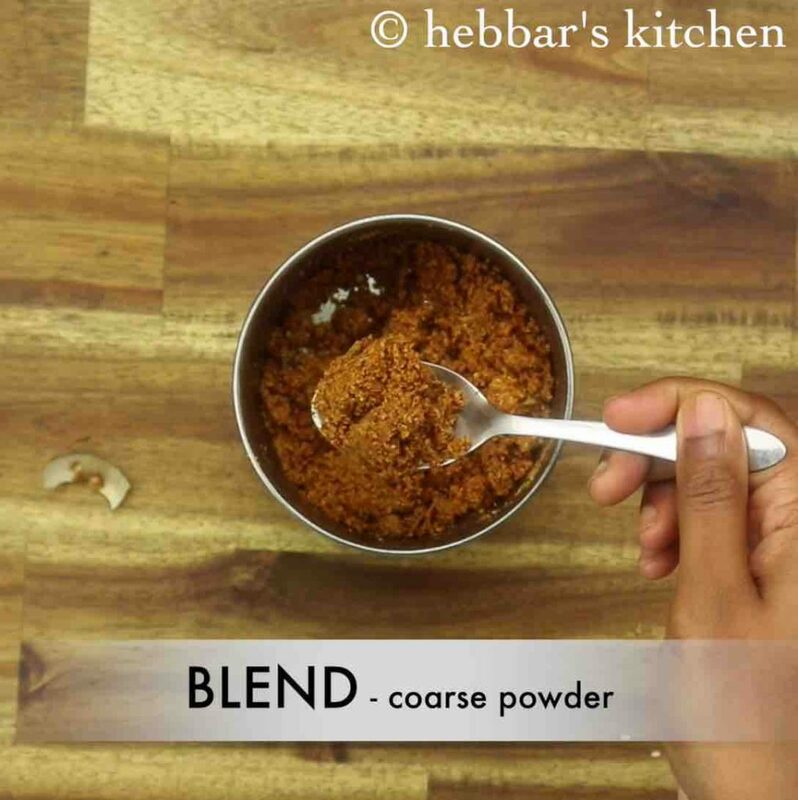 now blend to coarse powder without adding any water. keep aside. 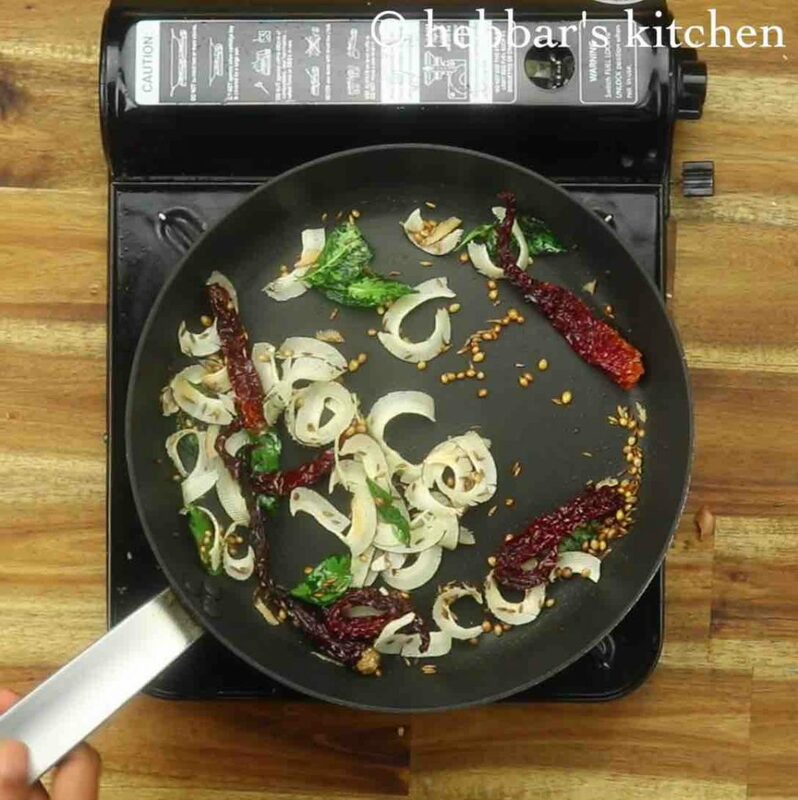 in a large kadai heat 2 tbsp oil and saute 1 tsp cumin. add in ½ onion followed by 1 tsp ginger garlic paste and saute well. 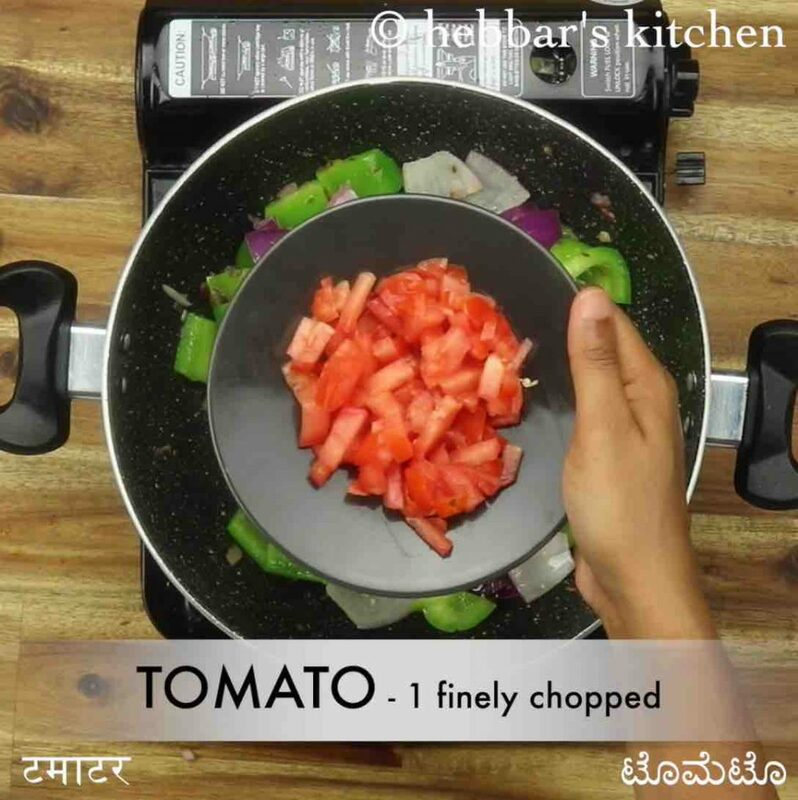 additionally add 1 capsicum, ½ onion and saute for 2 minutes. saute until the onions shrink slightly. now add ¼ tsp turmeric, 1 tsp salt and mix well. add in prepared masala and saute for minute. 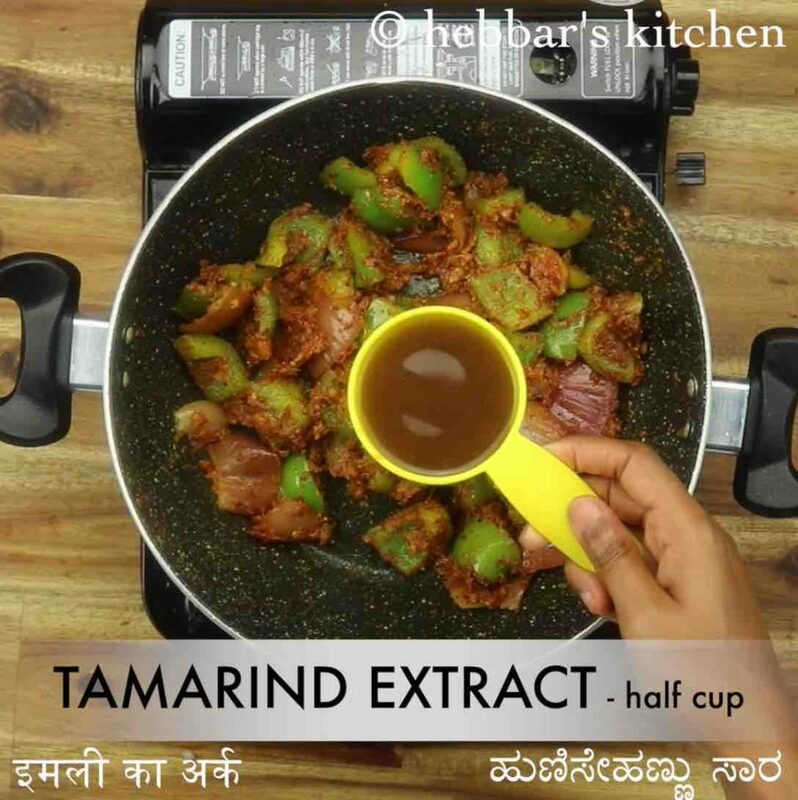 now add ½ cup tamarind extract and mix well. add water as required adjusting consistency. 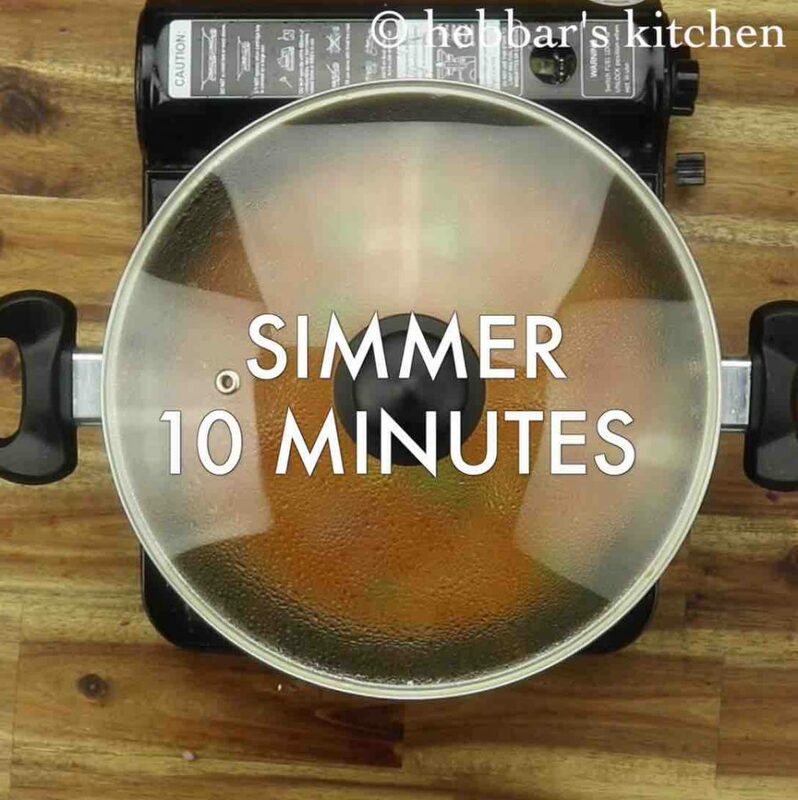 cover and cook for 10 minutes, or until oil separates. finally, add 2 tbsp coriander and enjoy capsicum masala curry with roti. 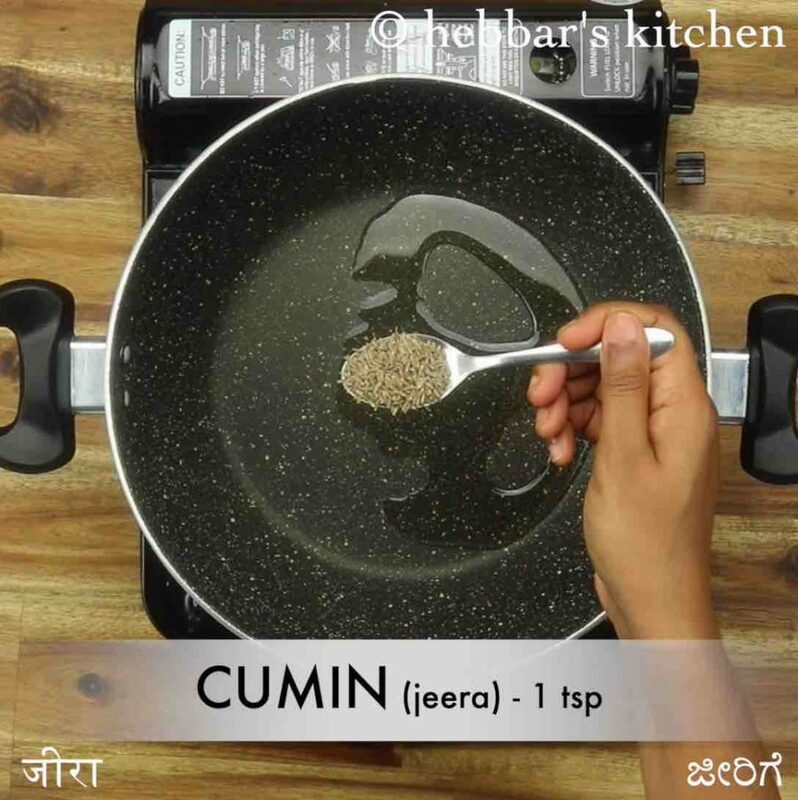 now in the same pan add 1 tsp coriander seeds, ½ tsp cumin, ¼ tsp methi. roast for a minute. add in prepared masala and saute for a minute. 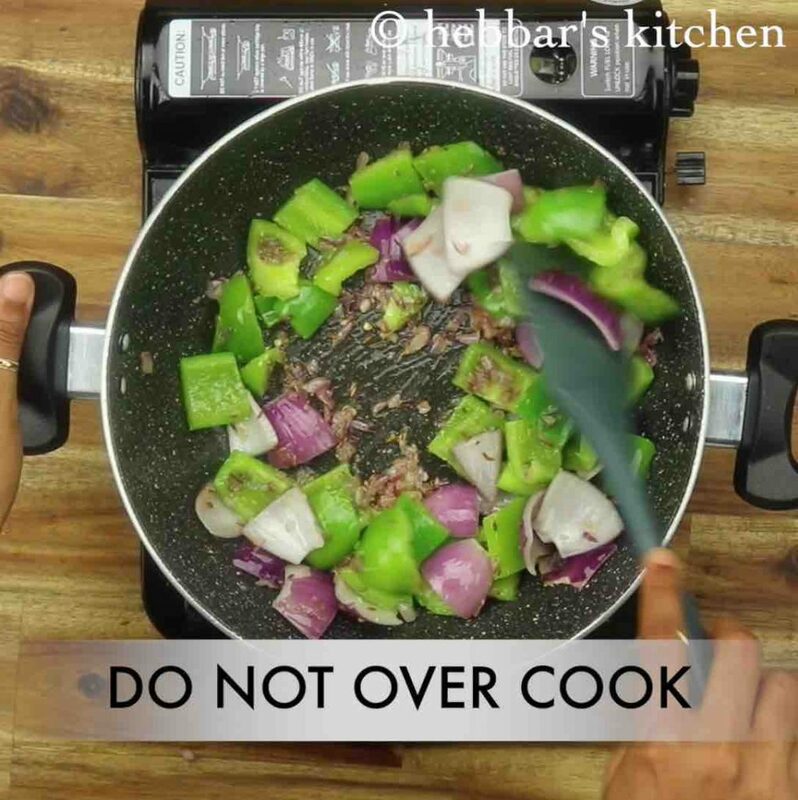 firstly, do not overcook capsicum as they turn mushy. 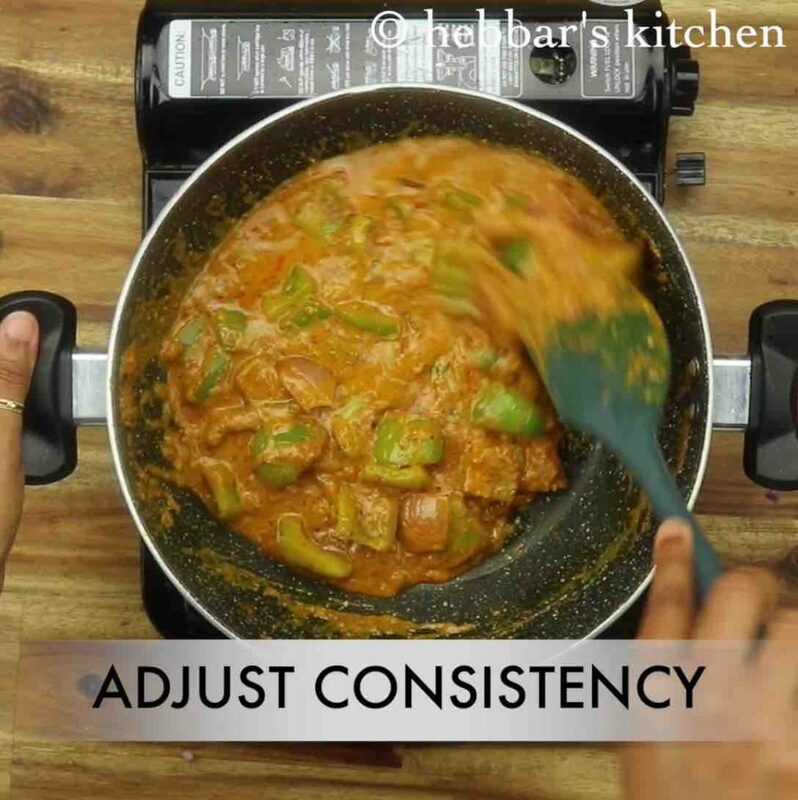 also, adjust the amount of water to the desired consistency. additionally, add different coloured capsicum to make it look attractive. 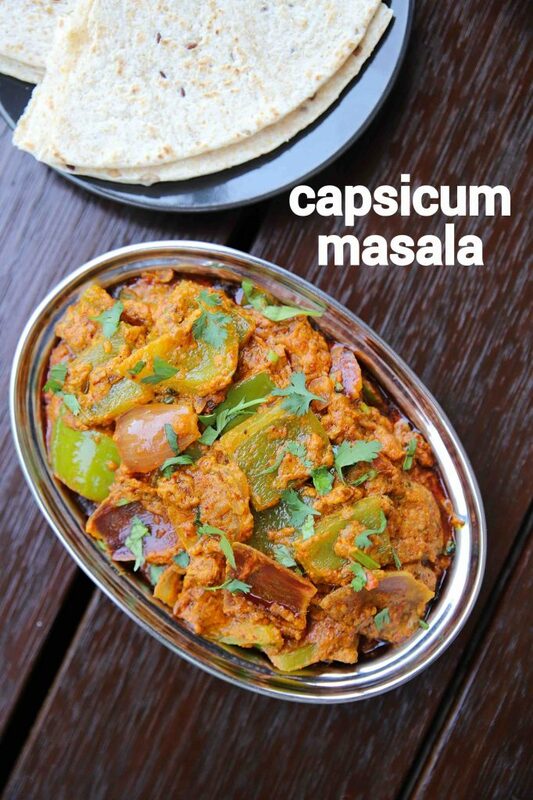 finally, capsicum masala curry recipe tastes great when prepared spicy.